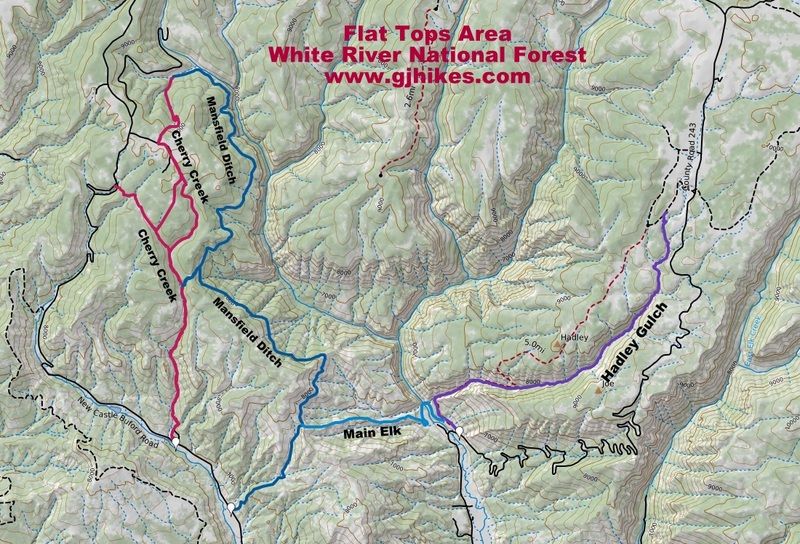 The Cherry Creek trail is located in the Flat Tops area of White River National Forest near Rifle, Colorado. The lower end of the trail begins off of the New Castle/Buford Road where it climbs along Cherry Creek. After several miles the trail splits with the right fork continuing along the creek and the left fork continuing to climb until it reaches another junction with the New Castle Buford Road. There are actually 4 segments of the Cherry Creek trail that all have a trailhead and interconnect in some way. The mid section of the trail and the upper end are both connected to by the Mansfield Ditch trail. To get to the trailhead take the New Castle exit, Exit 105, on Interstate 70. Head north to the roundabout where you can get onto Highway 6 heading into town. Drive through town on Main Street and turn north on 7th Street. Seventh Street will turn into Midland Avenue which will become the Buford Road. Just past the 4 mile point the Buford Road will take a right fork and after a little more than another 5 miles will come to the trailhead which is on the right hand side of the road. There isn't a lot of room to park but a few vehicles can pull far enough off to the side to not block traffic. The Cherry Creek trail starts out a little rough in places but it quickly gets smoother as it begins a moderate climb. As the trail continues climbing the oakbrush begins giving way to tall quaking aspens. There are mile posts along the trail although we never did see the post for the 1 mile point on the way up or coming back. It might be there and we just didn't notice it. Just past the 2 mile point a short spur comes up that runs over to the Mansfield Ditch trail. 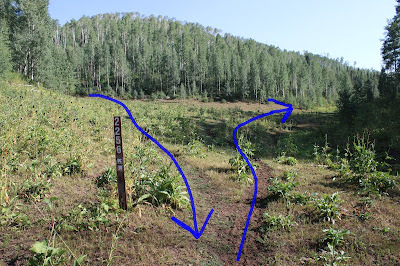 The slope of the trail moderates as it continues past the Mansfield Ditch spur. Around the 2.8 mile point the trail makes a split. If you go to the left you can continue along the main branch of the Cherry Creek trail all the way up to the Buford Road. That branch makes for a 5 mile hike one-way. Mountain bikers like to park at the lower trailhead and ride the Buford Road up to the top of the main branch and then ride down it to get back to where they began. For this post we are taking the right branch to get on top and then coming back the other way. The next half mile or so of the right branch is about as pleasant to hike as anything that you will find anywhere. The trail works its way up the grassy little valley as the stream flows gently by. As the trail gets to the head of the little valley it begins a much steeper climb until it reaches a private property fence line. At that point the trail climbs out of the drainage and travels along the fence. At the 4 mile point another branch of the Cherry Creek trail forks off on the left. We labeled it the Nordic Cutoff since it is marked with blue diamonds and serves as part of a winter Nordic loop. A short distance further and the Cherry Creek trail comes to one of its many trailheads. This one you can get to by turning off of the Buford Road about 3/4 of a mile past the upper Cherry Creek trailhead and then follow the road in to the private property fence and driving down it to this point. There is yet another trailhead that is located off a short spur a little less than a half mile from the Buford Road on the same route. This trailhead marks the beginning of a branch of the Cherry Creek trail that travels over to Spring Camp where it meets up with the top of the Mansfield Ditch trail. An epic ride or backpacking trip would be to combine the Cherry Creek and Mansfield Ditch trails to make one big 17 mile loop. For this post we turned around and went back to what we are calling the Nordic spur and took it down to where it connects up with the main branch. From there is was about 3.2 miles downhill back to the trailhead. There are a lot of route options for the Cherry Creek trail including making a shorter loop at the Mansfield Ditch spur trail that comes up at the 2.2 mile point. Instead of having the Cherry Creek A, B, C and D trails it would be a little less confusing if they each had a different name or at least put trail markers with the letter of each branch. Our Forest Service map labeled them all as 2256 much the same as the current trail signs. As far as hiking goes no matter which route you take should be pretty nice. And yes, we did notice a few pin cherries near the lower end of the trail. If you would like to see it for yourself then all you have to do is 'Take a hike'.